You only have to leaf through the pages of a surgical instrument catalogue or browse the pages of a surgical sales website to see a wide range of instruments and devices, but who are they named after? Kelly Forceps are a type of haemostat,( a surgical instrument used to control bleeding) they can also be used for occluding blood vessels and manipulating tissues amongst other purposes. They are named in honour of Howard Kelly, MD who is cited as one of the first Professors of Obstetrics and Gynaecology at John Hopkins University. Crile Forcep was designed by George Washington Crille born in Cleveland, Ohio. Dr Crile was a teacher, lecturer and author as well as a surgeon and was the founder of the American College of Surgeons. His accomplishments do not end there though, he is credited as being the first surgeon to have succeeded in a direct blood transfusion. The Forcep is most commonly used for clamping blood vessels or tissue prior to cauterization or ligation and in laparoscopic procedures for soft tissue dissection no deeper than 6-8 inches. Metzenbaum Nelson Scissors – Born on 1st April 1876 in Cleveland, Ohio Myron Metzenbaum was an American surgeon specialising in ear, nose and throat medicine and was considered an authority in the field of reconstructive surgery. His namesake scissors are most commonly used for dissecting and cutting tissue. Metzenbaum-Nelson scissors tend to be longer than standard Metzenbaum scissors and are well placed for thoracic procedures. Aufricht Scissors – The father of plastic surgery ( as credited by the America Board of Facial Plastic and Reconstructive Surgery ) Gustave Aufricht led an exploratory frontier in surgical reconstruction and functional repairs to improve patients appearance. He was born in Hungary in 1894 where he also attended medical school before moving to New York in 1923. The Aufricht Scissors are a multi-use tool used in endonasal and rhinoplasty procedures. Chevalier Jackson Tracheotomy Tube – The Tracheostomy was an ancient hypothesised procedure adopted as early as 3600BC by the Egyptians, it wasn’t until 1909 however that that a lower tracheotomy was undertaken by a physician called Chevalier Jacksons ( he also earned the label as the father of endoscopy ) and it was used as a means of providing emergency ventilation to patients suffering obstruction, disease or tracheal damage. 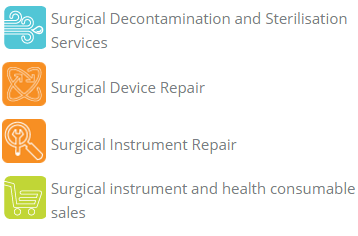 At STERIS Instrument Management Services we offer a range of surgical instruments, over 4000 in fact ! we also offer a prototype service for any surgeons wishing to join our list of surgical pioneers. Take a look at our website or contact us to find out more.